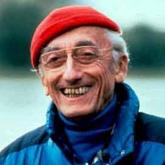 Cousteau was born on 11 June 1910, in Saint-André-de-Cubzac, Gironde, France to Daniel and Élisabeth Cousteau. He had one brother,Pierre-Antoine. Cousteau completed his preparatory studies at the Collège Stanislas in Paris. In 1930, he entered the École Navale and graduated as a gunnery officer. After an automobile accident cut short his career in naval aviation, Cousteau indulged his interest in the sea.